On an uncovered cookie pan, place Bread Slices and toast lightly in the oven for no more than a minute and a half. 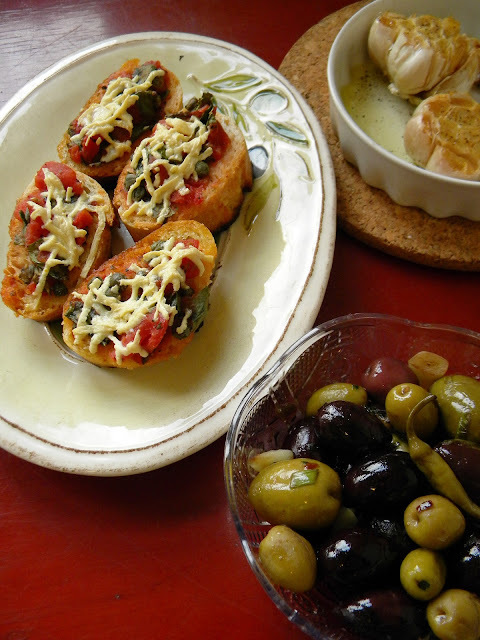 In a large bowl, mix all ingredients except Olive Oil, Bread and Daiya. When you remove the Bread Slices from the oven, just flip them over in the same spot and drizzle 1 Teaspoon of Olive Oil over each Slice of Bread. 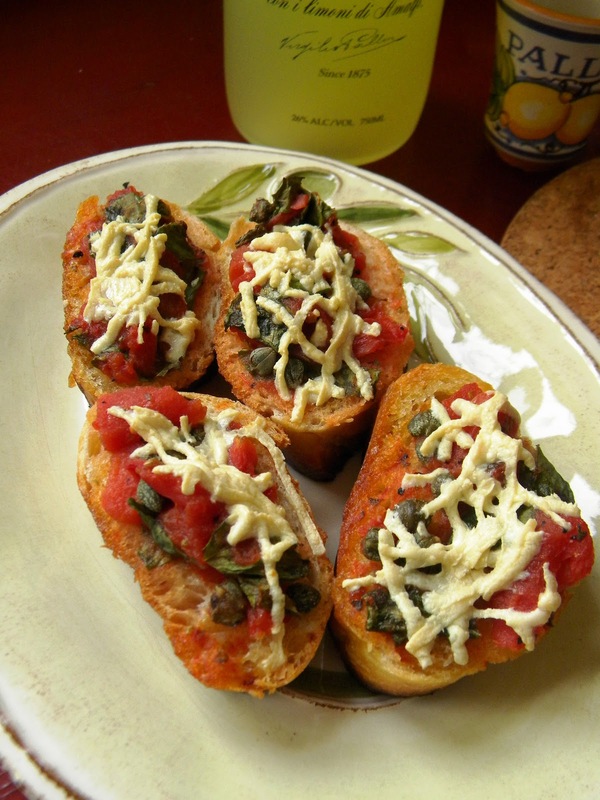 Then spoon just enough of the Tomato Mix over each toasted slice of bread to cover it evenly. You will have some leftover but that's OK. Just put it in a cup for dipping crusts later. Then put the pinch of Daiya on top of the Tomato Mix and put the pan back in the oven. Let bake for no more than 10 minutes. Check on them often. You want to remove them when the crusts are golden brown and the Daiya is melted. Serve warm and remember napkins that can be messy. I was suspicious of trying to improve Olives. Betty was right again. These little guys are GOOD! In a saute pan (or if you're like us, your amato cast iron skillet) heat your Olive Oil on a medium heat. Once you can see the Oil is warm, toss in Parsley, Green Onions, Red Pepper Flakes and Garlic mix. Let them cook while you stir occasionally until the Garlic begins to brown. 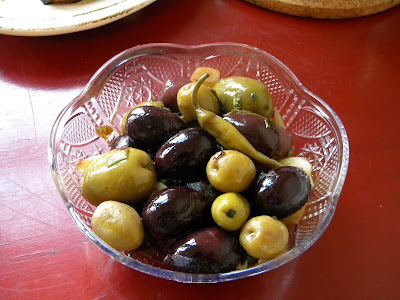 Then add the Olives with whatever oil and juices you can from their container. Stir occasionally and simmer until the Olives are tender. Remember when you serve them to provide a place to put your pits... it'll help keep the night classy. Sometimes I think Roasted garlic looks good - sometimes not so much - but even when it's ugly - it's DELICIOUS! Cut about 1/4 of an inch down from the tip of the Garlic Bulb to expose cloves. Carefully peel off the paper skin from each bulb - be sure to leave just enough to hold the bulbs together. Then place them - exposed cloves up in a small oven safe dish and drizzle the Olive Oil over the bulbs. Salt and Pepper to taste. Cover with foil and put in the oven. 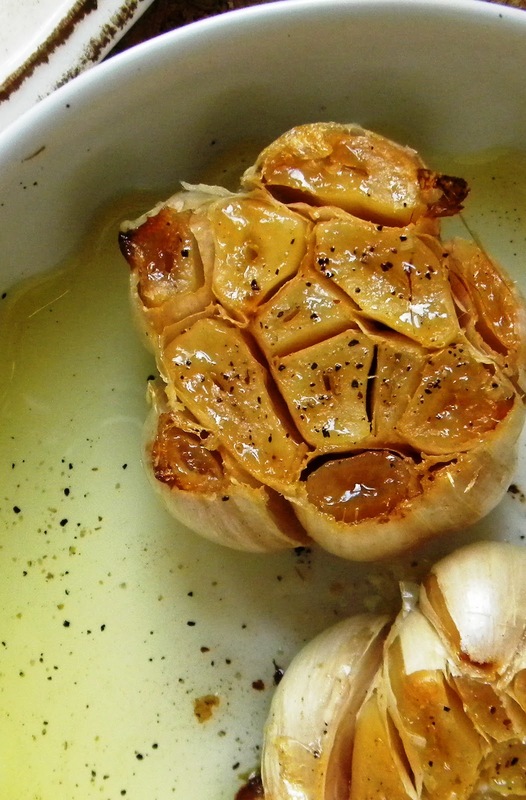 Bake for 45 minutes or until the Garlic is tender when you poke them with a toothpick. Let them cool and then serve by gently squeezing the soft paste out of the roasted cloves over the slices of bread. Ooh, now I'm hungry! That Toasted Crostini looks really good. I'm adding that to the menu next week. Thanks! great idea, happy hours are always a false economy, as you end up hungry after a few drinks and then paying extra for food etc. I love the Italian theme idea too - quite healthy for new year.